Another day, another classic kit. It seems that LED heart-shaped displays are a timeless novelty, so after building a multi-coloured chasing heart and a breathing heart, why not a flashing one? 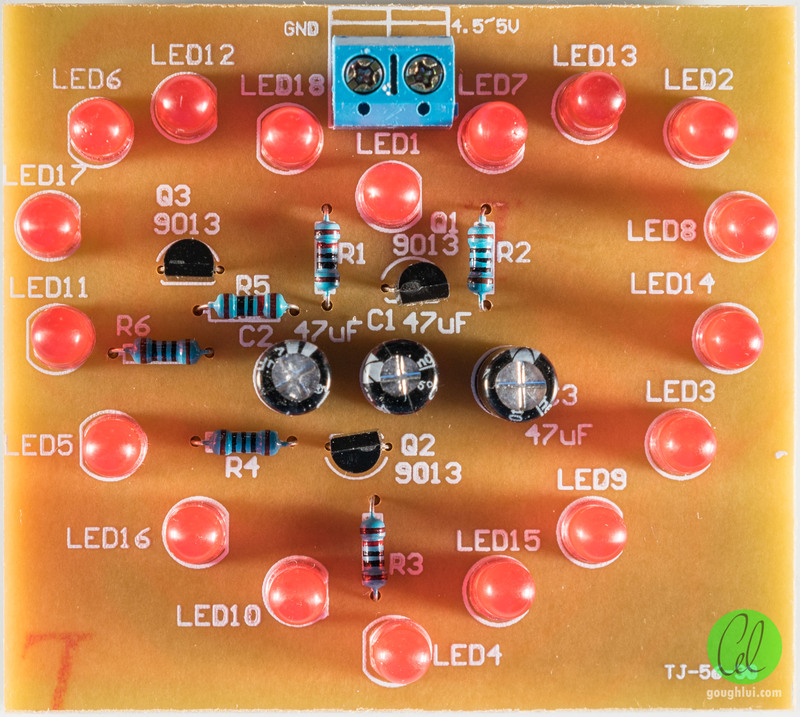 For just AU$1.68 including postage, I managed to score this kit from eBay which is an upgraded version of the classic two-transistor flasher circuit. This kit looks like any other cheap eBay kit from China, in that it’s packed in a zip lock plastic bag. But already, from the beginning, we see an improvement – they included a leaflet! 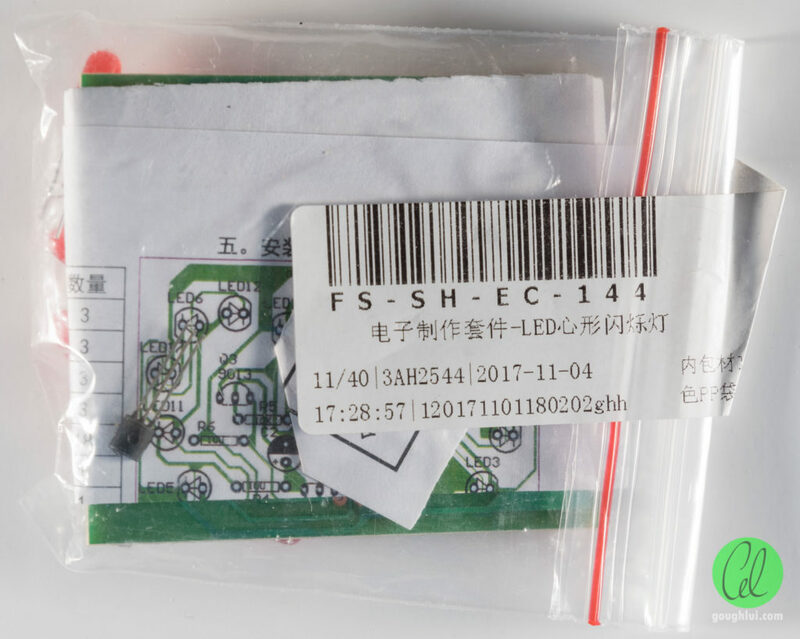 The kit is built on a standard “boring” square PCB, being of the single-sided paper-resin variety. White silkscreening on the front gives clear indications as to how to mount the components and their values. The kit seems to have a designation of TJ-56-30. 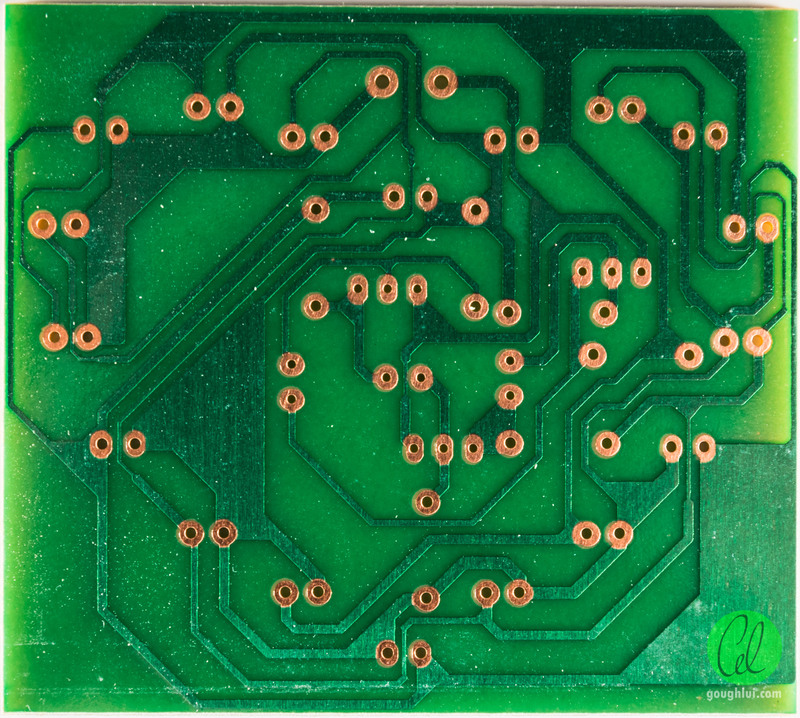 The underside reveals lacquer-coated copper pads and green soldermask. 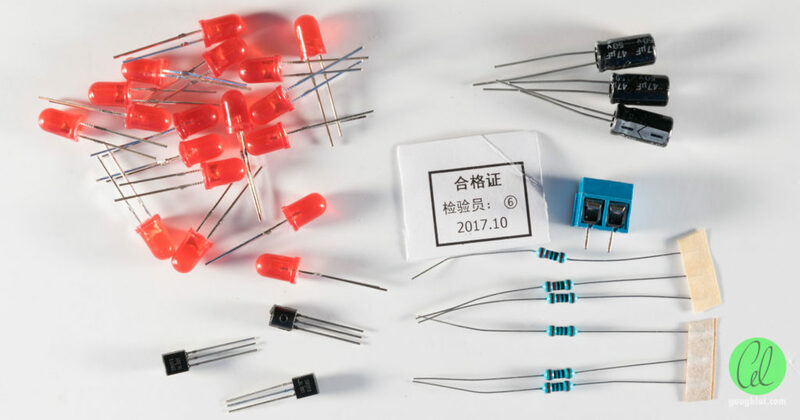 Included are the LEDs, transistors, resistors, capacitors and a set of terminal blocks for power connection. A quality control tag is added to the bag as well. 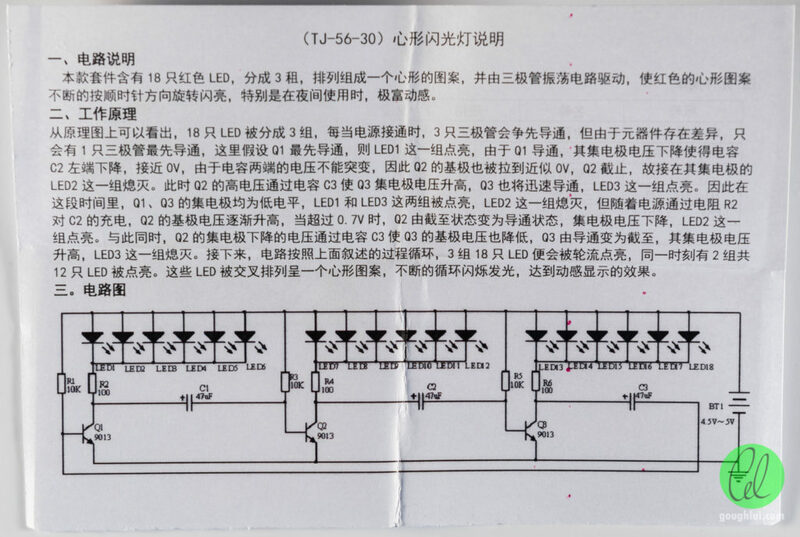 The included double-sided half-page of information is in Chinese (which, sadly, I cannot read). 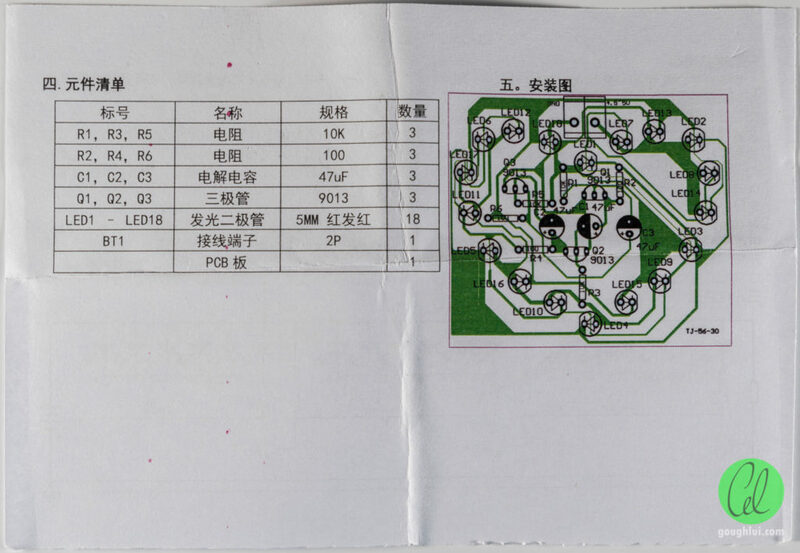 However, it does include the schematic, as well as the bill of materials and PCB design which is handy reference. We can already see that this is a standard collector coupled astable multivibrator design, albeit with three branches rather than the more usual two. This isn’t a particularly high number, which should make the kit quite suitable for a novice. In all, including photo taking and testing, it took me about 40 minutes from start to finish. Overall, the construction experience was not bad, but could be improved. For once, I dislike lacquer coated paper-type boards for soldering, mainly because the lacquer can interfere with formation of the joints, thus requiring a little more heat and care when soldering. The type of board is also more sensitive to overheating, so this isn’t necessarily a good thing for a beginner to have to deal with. The fumes from this sort of board, while distinctive, aren’t exactly the most pleasant to deal with either. The pads were a little on the small side as well, making solder control critical. 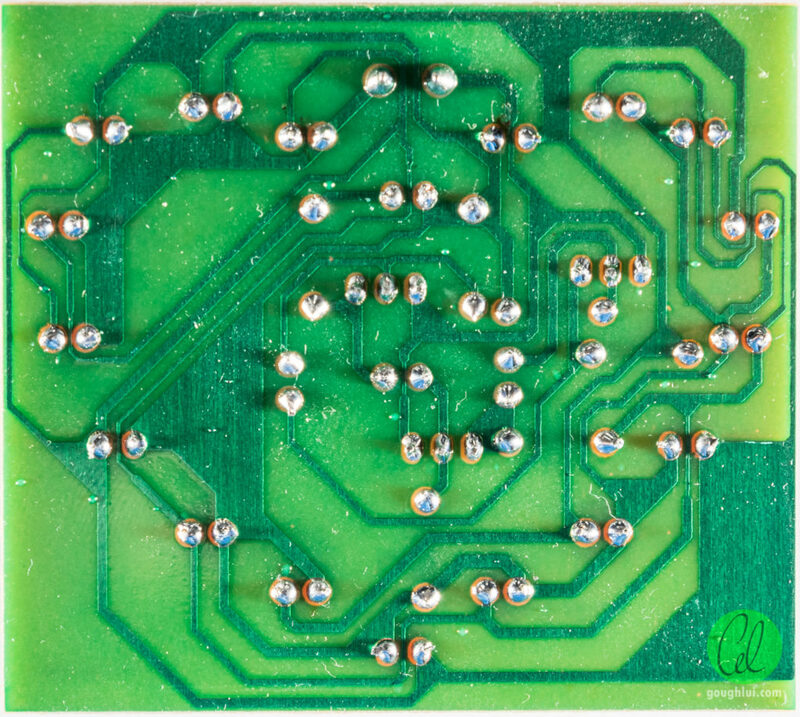 The shape and routing of the traces were almost haphazard, along with the directions of the LED polarities, making it highly probable that a mistake could be made necessitating extra work to resolve (increasing the chance of damaging the board). Finally, there were no spare parts and only exact quantities were provided. That being said, I suppose, given the low cost, it’s something to be expected and are only minor niggles. The result is a heart which has two-thirds of the LEDs lit at any time, chasing around the perimeter in a way that is reminiscent of some of those LED restaurant signs. Note that the capacitors and terminal block don’t move in operation – that’s a side effect of perspective shift and post-processing to remove hand shake from the recorded video. Finally, I simulated a simplified version of the circuit (omitting the parallel LEDs) in Analog Devices LTspice, which clearly shows the behaviour of the circuit (albeit substituting the transistors with “close enough” equivalents. If you want, the model file can be downloaded here. Simulators often have problems (in my past experience) simulating these types of circuits as their stable oscillation only occurs when the components have some “mismatch”. It was interesting to see that, aside from the initial glitch, it seems like the simulator worked just fine. This kit is nothing but a simple classic design upsized. 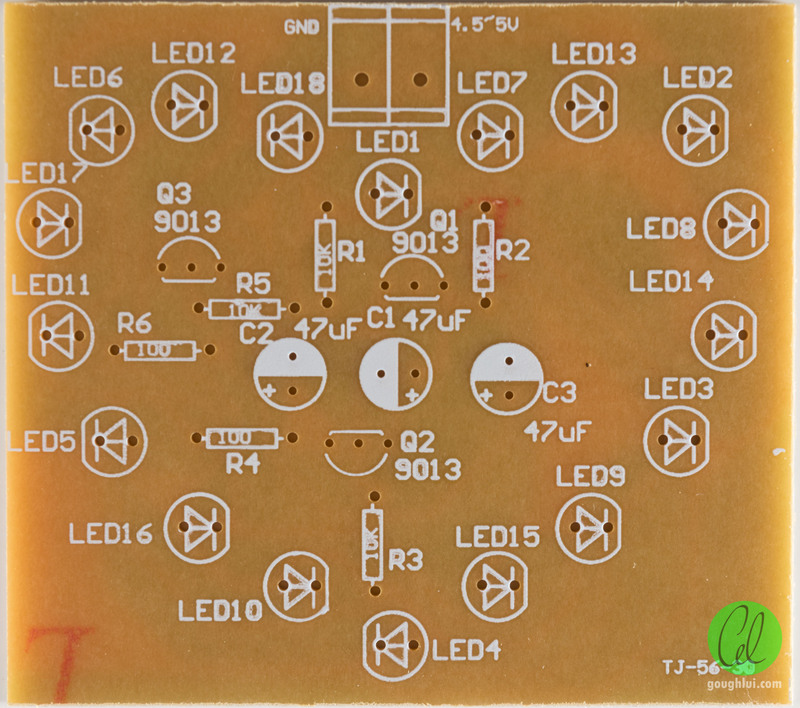 The kit itself was complete, although the single sided paper-type PCB with lacquered copper was not the easiest to solder. The quasi-random directions of the LEDs and the odd trace patterns also were not helpful, however, it did come with Chinese instructions that included a schematic, adding to its educational value. For the price, it’s a decent amount of fun and soldering practice.